The Solenads form part of Ayala Land's continued pace and trend setting in shopping center development in the country. Nuvali, which is located in southern Manila, is the go-to place of the Laguna residents as well as those of the neighboring provinces such as Cavite, Batangas and Muntinlupa. Nuvali is also increasingly becoming the favorite weekend destinations of some Manileños. If you've been at Solenads 1 and 2, you probably have an idea of what to expect in Solenad 3. Nevertheless, there is more to Solenad 3 that you cannot find in the first two wings. In brief, the Solenads form part of Ayala Land's continued pace and trend setting in lieu with shopping center development in the country. For the real estate giant, malls should not be treated as mere places to shop and dine, but also as lifestyle and cultural centers. Ayala malls put architecture, artistry and design in front and center. The goal is bringing the good life to the Filipinos while building a community. Each Ayala mall is built with its distinct concept and the Solenads are no exemption to this. For one, Solenad 3, which totals to 55,000 sq. m of retail space, is built with lush greeneries and open spaces to offer the shopgoers with a leisurely experience. 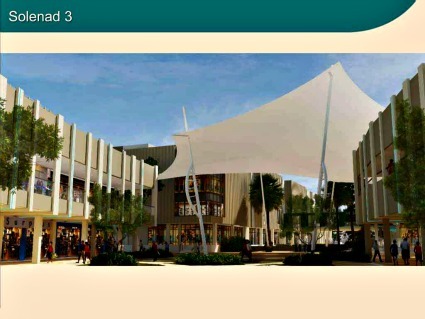 Specifically, Solenad 3 has seven interconnected buildings that can accommodate up to 408 shops. These shops will surely encourage hoards upon hoards of foodies and fashionistas. Some shops such as the House of Bawai is enveloped by the gardens. It also has its own version of 'Market Market' wherein stalls are quickly being occupied. This is the venue for flowers, fruits and vegetables. Aside from this, it will have a hawker's market-inspired food court. Further, Solenad 3 also has a two-hectare outdoor activity park where events and other recreational options can be organized. For instance, Mercato Centrale is holding its Food Truck Fair at the activity park on Saturdays and Sundays from 11am to 9pm. The park is complete with an atrium that can be converted into an events venue. Another important feature of the park is the outdoor playground where kids can enjoy the slide, spring riders and glow-in-the-dark swings set on vibrantly colored rubber flooring. What sets it apart from the other two is it will house the ecocity's very first movie theaters, giving people more reasons to explore the place. Options for moviegoers are very limited and movie houses are basically scattered. These cinemas are set to open this December. During its launching last August 6, Bobby Dy, President and CEO of Ayala Land Inc. shares, “We really wanted something different from what you would find in the retail offerings in Sta. Rosa. True enough, we’ve differentiated ourselves.” Surely, the locals and visitants will appreciate the distinction.